I thought it might be fun and interesting to blog a little bit about our progress on the SLP project. First, what is SLP? It stands for Simple Ledger Protocol. It's a token system for Bitcoin Cash. Here is the spec you can read. This spec came together in amazingly short period of time. I think 6 or 7 days. Magical things can happen with the synergy of working with a really powerful team. And I'm already seeing how we're going to get some incredible results as far as creating a working wallet implementation quickly. My goal is to have this wallet available by August 31st... a little over 30 days. Earlier today I completed most of the Send tab for tokens. As a prerequisite, I needed a bit of the storage layer. We need to store information about the different kinds of tokens that the wallet is going to manage. Each token has a hash identifier plus a more human-readable common name. There's also probably going to be a decimal precision associated with each kind of token. I thought we might have a separate token file, but the storage/configuration system is passing around the config file in too many places to do it cleanly. It wasn't worth disturbing all that so I just put the token info in the config file. Then I added some widgets to the main screen. I added a separate "SLP Amount" field and also a drop down selector for which kind of token we want to send. 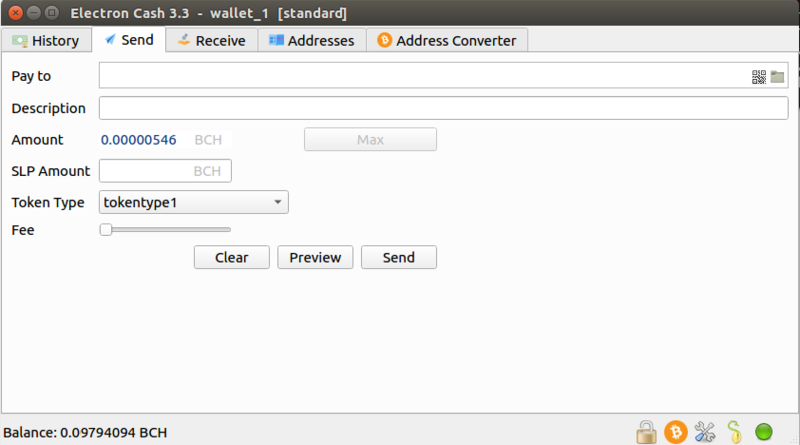 I decided that it would still be a good idea to show the BCH amount being spent just for transparency to the user... but I also decided to make it safe and force the BCH amount to be the dust amount if a token was selected, plus freeze the amount field. If "NONE" is selected, the amount is zeroed out and unfrozen. The "max" button needed to get frozen and unfrozen as well. Stay tuned... a lot more fun development coming and I'm looking forward to bringing the Simple Ledger Protocol to Bitcoin Cash. There's also probably going to be a decimal precision associated with each kind of token. @tula what i mean is some people will issue a million tokens, some a trillion, the wallet needs to know to display <tok amount> or <kilo token amount> etc. I'm not literate in programming, but I like the simplicity approach. Simple, well built stuff is hard to break in the physical world so I assume its the same in the computing world. Can this op-return token system be run simultaneously with the proposed group approach and the wormhole cash approach? Eventually one proves the most efficient system and the others drop off? Awesome, cool to see so much progress so quickly!